Since Thanksgiving is this week and we're all making our grocery lists and planning for lots of time in the kitchen, it seemed appropriate for us to talk about all the features we'd love to have in our kitchens. So this week's blog is all about dreams and what you might want to put on your kitchen wish list for that next remodel. Obviously, there are some main things that are must haves and should be at the top of the list. Things like, lots of lighting & plenty of seating are a couple that come to mind. When it comes to lighting, remember that kitchens have come a long way and it's not just meant to be a task space. Task lighting is important, but try to incorporate different levels of lighting for the best effect. Overhead, undercabinet, and decorative. And as far as seating goes, if you want your kitchen to be a gathering place, be sure that it has places for people to sit. Maybe this requires a banquette or a small bistro table with two chairs in the corner or maybe it's a long island with multiple barstools. See how your kitchen can maximize it's seating space so people want to spend time there. Beyond that, we wanted to share with you some pretty fabulous storage ideas that will make your functioning kitchen a dream kitchen (not to mention jumping the value of your home since kitchens sell homes). Pimped out drawer storage is the best way we can think of to describe these organzied drawers. How nice would a drawer like this be?! No more loud noises and fighting cookie sheets--it's just all separate and organized and tucked away neatly! What a perfect use for that skinny shallow drawer! Adding the right separators maximizes it's space and eliminate the junk drawer where things go to die. I mean, really, Who would wants a perfectly organized, easily accessible spice drawer like this one? Tupperware drawers often become the second messiest place in the kitchen (after the utensil drawer) but this well-suited stacking storage drawer could save days of your life that might be wasted searching for that missing lid. And finally, the pot and lid drawer. One regular lower cabinet and the right hardware and our lives are complete. Since counter space is always a hot commodity, there are a few other things we'd recommend to help you maximize your kitchen functionality as well as keep it looking fabulous! Hello, hidden coffee station! We know that coffee paraphernalia can sometimes be used as decorative but it can also quickly overtake the kitchen countertop too....so save yourself and incorporate something like this into your next kitchen remodel. And of course, everyone has that "junk" collecting section of their kitchen where the mail lands, along with their keys, pens, and sunglasses. Instead of leaving that out on the countertop to take up space, incorporate a little hidden end cabinet that hides and organizes it all! We're just gonna to say--this is genius! Finally, don't forget about your trash and recycling. We get that the kitchen is the place for the trash can, but it also doesn't have to become an eyesore. Double can storage like this is ideal for any kitchen! It also leaves more floor space for seating! There's always something changing in design. It's such a fluid art form that you never know what you're going to start seeing on the trends list next. 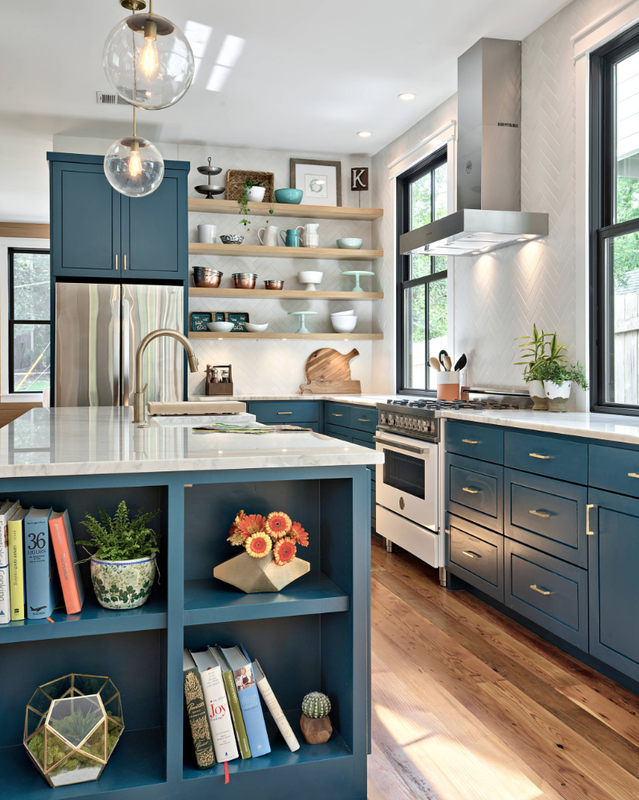 Since kitchens are a huge place for design being that they're one of the high-traffic spaces in a home on top of being functional and important for resale, the trends seem to be constantly evolving here. Design used to be limited in kitchens because it was always the basics--cabinets, appliances, a countertop and backsplash...but it's not like that anymore. So many new products and applications have been developed for kitchens. So many exceptions and allowances have been made for what is "acceptable" in a kitchen and rules have ultimately been broken. The decorative part of a kitchen has become huge and homeowners value a beautiful kitchen that flows with the rest of their home. So today we're going to talk about those trends and what they currently look like. You will probably notice a lot more of these things once you read this article too! It used to be that wood in a kitchen was only for the cabinets. Now wood is all over the kitchen! Wood look tile is being used as a backsplash application and raw wood is being used in bar kick-plates and exposed shelving! We feel like wood is so versatile that, even though it was very connected to the rustic style, it can be used in so many other applications to just add some warmth. Modern is great, but there's still a love for the original style---traditional. That clean, classic style that has transcended time is just a comfort for people in kitchens. Even if they appreciate modern, a little bit of traditional is good too. It's sort of like wood--it can mix well with most things! The way this style manifests itself in kitchens varies but look for it and we're pretty sure you'll find it! One of the best ways to modernize a traditional item is by using a version of it in a larger scale. This impact is huge in kitchens. Larger scale lighting, hardware, and even hoods is key right now. These items are sort of the jewelry of kitchens so people like the idea of showing them off. Large lighting and an amazing hood also make great focal points in a kitchen! Since we've moved away from a lot of the beiges and browns, greys, blacks, and whites have become much more popular in kitchens. We love an all white kitchen but understand that some homeowners are scared of it. For that reason, we're also cool with mixing. Currently, contrast is big! Dark counters and light cabinets or vice versa is another way to put a modern twist on the traditional style. If this feels too cold for you, warm it up with interesting lighting and texture in your barstools or backsplash. So what do you think? Are you into this kitchen trends? We think they're so fun and love how the kitchen design world is evolving! Wallpaper is still here! Yep! Surprise, Surprise! It hasn't faded away from the trending pool. It's still holding it's own on the design spectrum. So today we're going to talk about all of the ways you can use wallpaper in and around your kitchen. We understand that tile can get expensive and there are lots and lots of options for color, style, and pattern when it comes to wallpaper so why not put it to work?! The other nice thing about wallpaper is that it's a much easier change then tile is. It's more work than paint but there's a lot more visual interest with wallpaper so the price is worth it. Although we don't recommend paint accent walls anymore, we do recommend wallpaper accent walls. The reason for this is that wallpaper and paint can still coordinate with overlapping colors whereas a paint accent wall is going to be a completely different color and can easily look like color-blocking. The kitchen is no exception when it comes to accent walls and wallpaper is an easy option. Go clean on your cabinets and countertops and throw a little pop in there with a funky wallpaper and you've got a fun kitchen. A lot of people want to put their wallpaper in a focal area but there's something to be said for a little unexpected punch of pattern in your kitchen. Areas like the kick-plate of an island or peninsula, or the back of open shelves. These little spaces are perfect areas to add charm and visual interest without a ton of pattern becoming overwhelming. Since wallpaper also comes in textures, a little texture could be exactly what your kitchen needs to warm it up a bit. Grasscloth is so fun and adds a ton of depth! One of our favorite places to add wallpaper is on the ceiling. If you have an eat-in kitchen and want a fun way to segregate the dining area, try wallpapering the ceiling area over the table. This could work for the area over the island too. Any little focal space can have a little trim added to the ceiling to frame out some wallpaper and without the hassle of a rug, you've automatically defined the space. Remember. There are a variety of types of wallpaper that can work well in kitchens. Obviously patterns do hide dirt and grease, but vinyl wallpapers are great for wet areas. They are wipeable and durable! We just love wallpaper so much that we want to see it everywhere! The market is improving and many home owners are ready to start updating the homes they've been stuck in for the past few years. Since the most return on investment normally comes with updating kitchen's and bath's, plus the fact that the kitchen is such a highly-used space, the kitchen often becomes the construction zone as home owners want it right. If you're in the process of a kitchen renovation or maybe you're building your own home, be sure to have them builder add some of the following finishing touches so that your kitchen looks complete. The ones that you decide to go with may be dictated by the style of your home, so don't plan to incorporate every single one. But definitely review the list and determine which details are right for your kitchen space. Depending on your kitchen layout and the cabinet materials, matching ends is a very important finishing touch. The side panels on cabinets can be eyesores and in the middle of a beautiful kitchen, you don't want this simple little detail to haunt you. Matching ends are easy to make and install, it's basically just another cabinet door made to the size of the exposed side of the cabinet and applied. It sort of makes the cabinet look like there's a side door but there's no handle. It's nice. And it makes a big difference. So go for the matching ends! Crown molding is always a nice finishing touch in kitchens as well. Now, again, this goes back to the style of kitchen that you have, but if you have something a little more traditional or even transitional this would be perfect. Not only does it bring height to your cabinets, it actually adds depth & dimensions. It can make your cabinets feel like an architectural detail which steps up the whole look of the kitchen. There are a variety of sizes and styles of crown molding too, so if you prefer something a little more simple with clean lines because you're trying avoid an overly-orate or traditional kitchen, you can still have molding without going that route. Adding a pop of color is a sure fire way to make your kitchen feel custom and unique to you. This could be in the form of painted cabinets or maybe just a painted island or even colorful appliances. If the painted look isn't something you like, you may be able to do colorful hardware or a fun backsplash. Color really spices things up! One of our favorite designer details in a kitchen is glass front cabinets. It's not something to go overboard with but it can be done in a variety of ways to really make a kitchen look finished. The nice thing about glass front doors is that they come in so many different styles--single-paned, frosted, multi-paned, etched...you can get it with wood mullions or metal...just really so versatile. We like using them in small bits, like over the range or in smaller doors to add variety without the hassle. Remember, the cabinets that have glass front doors need to be kept nicer than the others since everyone can see in. This are some of the main items that we feel could be over-looked details that, if added to a kitchen, make for a really big overall impact. If you have to spend so much time in this space, it might as well be exactly how you want it, right?! We think so!